On one wall of Delirious:Art at the Limits of Reason, l950-1980 currently on exhibit at the Met/Breuer the curators quote Joan Didion thusly “An affect of vertigo and nausea does not seem to me an inappropriate response to the summer of l968.” Delirious is divided up in to sections entitled “Vertigo,” “Excess,” Nonsense” and “Twisted,” and the strategy is to present works that subvert and undermine the viewer’s initial perception of an ordered universe. It’s a theme show like the recent Unfinished: Thoughts Left Visible, employing pieces by a variety of artists to propagate an idea. Jennifer Bartlett’s “Fixed /Vanishing” (l970) creates an orderly grid whose bottom line is ultimately a question. A copy of Semiotext (e) the magazine that derived from Sylvere Lotringer’s conference “Schizo-Culture: A Revolution in Desire” features works by Kathy Acker, Jack Smith, Lee Breuer, Gilles DeLeuze, William Burroughs, Philip Glass, Jean-Francois Lyotard and Richard Foreman--luminaries of the period under examination who explored the fracture of consciousness.The sculptor Robert Smithson (1938-73) who is represented describes himself as a "keeper of derangement." 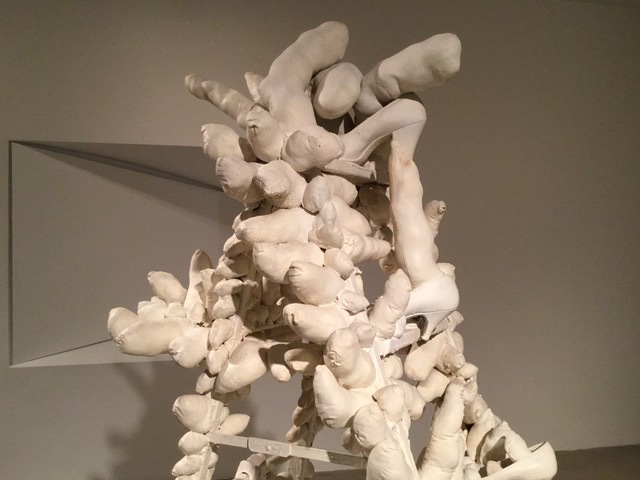 Yayoi Kusama's contribution which features penises and high-heeled shoes hanging from a pyramid shaped "Ladder" (1963) is the perfect accompaniment to Hannah Wilke’s kneaded eraser vulvas which shatter the calm surface of postcard art in “Grant’s Tomb” (1976) and “East Falls, New York” (l975). Not surprisingly Beckett, a major figure in the period, is an influence on a number of the artists in the show including Philip Guston, “The Street” (1970) and Bruce Nauman whose “Slow Angle Walk (Beckett Walk)” from l968 is an essay in absurdist perseveration. "In-Out Anthropophagy" (1973-4) by the Brazillian artist Anna Maria Maiolino is a video that against hearkens back to Beckett’s Not I (and the horror struck nurse in the famous Odessa Steps scene in Eisenstein’s Potemkin) by presenting a faceless gaping mouth, in this case not screaming but masticating. Pornosophy: Was Madame Bovary a Nyphomaniac? Is Your Self-Invention a Success? Another Hundred Years of Solitude? Sperm Count: What Turns You On?